I am happy that I am starting to attack my 2015 To Go list already. My friend Jon was in town and I suggested we try Redbird as it is conveniently located in Waltham, not far from the Pike. He agreed and we had an early reservation on Saturday. At 5:30, the place was only half-full but by the time we left at 8pm, the restaurant was packed, despite the snowy weather outside. The broth was delicious, although not terribly smoky. I loved the combination of fennel and bacon. 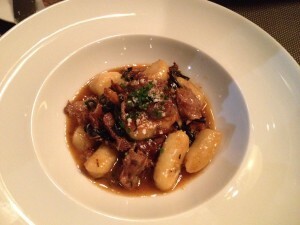 We shared the potato gnocchi ($12) as well. The light and fluffy dumplings were served with tender braised veal, wild mushrooms and in a Madeira jus. It was a perfect hearty winter dish. My only complaint is that both appetizers were small for the price. After all, how much can real estate in Waltham be, compared to Boston or Cambridge? 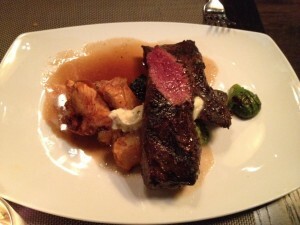 The grilled hanger steak ($28) was closer to rare than medium rare, but was tender and flavorful. The roasted Brussels sprouts were delicious, but the star was definitely the “Torn & Fried” potatoes. Next time I am there I will get a separate side order of them ($6); Steve will love it. The menu says that there is also bone marrow butter on the steak but it was unperceivable, both in appearance and flavor. 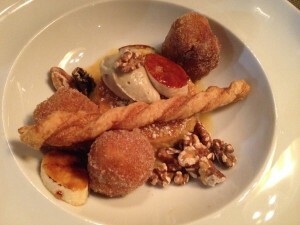 Our waitress sold us on the maple flan, which came with cinnamon sugar beignets, burleed bananas, walnuts and banana cream. The flan had a pronounced maple flavor and was the correct texture. The beignets were actually doughnut holes, but still tasty. I liked the dessert, but it did not blow me away, as the waitress had promised. Aside from the flan hyperbole, our server was nice - she was attentive and friendly. 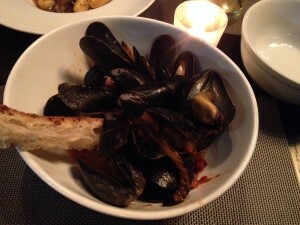 The breadbasket has the standard Iggy’s Francese, which I love and is great for sopping up the mussel broth. It comes with a honey thyme butter, which barely had any hint of honey, but was soft and spreadable. I hate when they give you ice cold butter that tears the bread as you attempt to spread it. I would definitely recommend you check out Redbird if you're in the area, it might even merit a trip if you're not. 2015 is off to a good start!